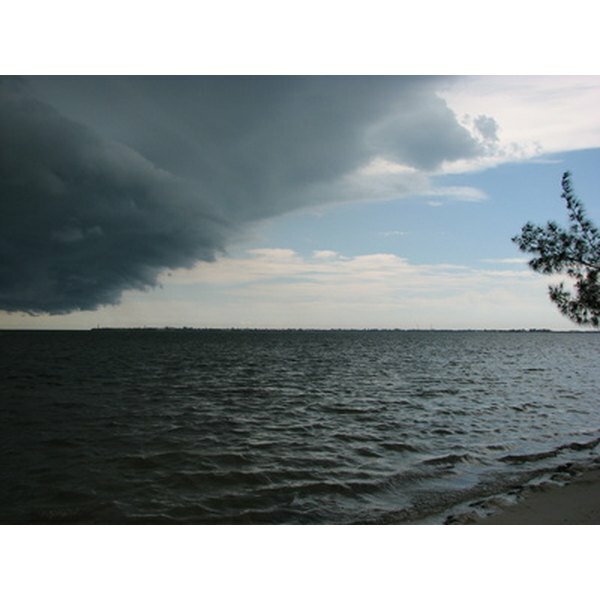 When it rains outside, it means that a front is moving through the area, which causes a change in air pressure. The change in air pressure during a rainy day can lead to sinus pain, or a sinus headache, according to "USA Today." A sinus headache may increase as the weather front comes closer and decrease once the storm passes, according to The Weather Channel. If you experience frequent sinus headaches, talk with a doctor, as migraine headaches are commonly misdiagnosed as sinus headaches. Sinus pain is the result of pressure placed throughout the head from inflammation in the sinus cavity. Your sinuses are composed of air-filled pockets. When these pockets become swollen, pressure is placed on the eyes, forehead, ears, cheeks and teeth, according to the University of Maryland Medical Center. A sinus headache resulting from a rainy day may be worse in the morning upon waking and progressively get better throughout the day. According to UMMC, sinus pain feels like a dull, throbbing pain in the middle of the head. The pain may worsen if you bend down or stand up quickly. Sinus headaches may make your face sensitive to touch, producing soreness. Rainy days are unavoidable. If a weather front causes a sinus headache, use over-the-counter drugs and natural remedies to combat the symptoms. Decongestants are used to reduce inflammation in the sinus cavity. Use decongestants with caution, as they can have adverse side effects, such as increased heart rate, sleeplessness and nervousness. Use steam and run a humidifier to help soothe the sinuses, according to MayoClinic.com. If a sinus headache persists after the weather front has passed, look for signs of a sinus infection. If the sinus cavity was swollen for an extended period of time, an infection may have set in. MayoClinic.com recommends seeing a doctor if you develop a fever over 100.5 F, symptoms last for more than 10 days and medications don’t provide relief. If your discharge becomes thick and yellowish green in color, seek medical advice. If you suffer from nasal polyps, chronic allergies, a deviated septum, chronic sinusitis or other nasal issues, you are at greater risk of developing a sinus headache from rainy days. Talk with a doctor about using preventive medications such as corticosteroid nasal sprays to maintain healthy sinuses.